Today it was Bruce Anstey's turn to set an TT ZERO lap speed record. Yesterday, Mugen's John McGuinness finished with a 111.904 miles/hr lap speed, and in today's qualifying round Mugen's Bruce Anstey finished with a 112.355 miles/hr lap speed. McGuinness finished with a 109.370 miles/hr lap speed after leading for most of the race. At the Ramsey Hairpin, he had a 127.182 miles/hr lap speed (12:07.462) to Anstey's 123.194 miles/hr (12:31.011). At the Bungalow the lap speed for both had slowed down a little, 122.300 miles/hr (15:59.610) for McGuinness and 119.486 miles/hr (16:22.207) for Anstey. The mountain took its toll, by Cronk-ny-mona McGuinness was down to a 118.022 miles/hr (18:39.448) lap speed, and Anstey down to 115.707 miles/hr (19:01.845) lap speed. By the Grandstand their positions reversed, with Anstey finishing with a 112.355 miles/hr (20:08.914) lap speed, and McGuinness finishing with a 109.370 miles/hr (20:41.917) lap speed. I'm guessing something happened to McGuinness - and it might be as simple as running a little low on energy. 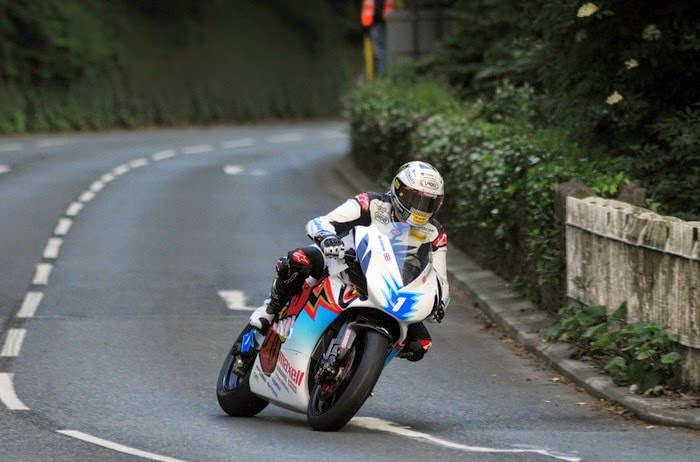 At the Sulby Speed Trap, Anstey was the fastest, 163.3 miles/hr, McGuinness next at 158.6 miles/hr, Sarolea's Robert Wilson next at 121.1 miles/hr, George Spence on the ION Horse at 109.8 miles/hr, and Brunel's Paul Owen at 100.2 miles/hr. Mark Miller, riding for Vercarmoto, wasn't recorded for most of the live.iomtt.com results, but he did finish the race. Missing from yesterday's lineup was: a) Buckeye Current - they posted on Facebook that on Friday a couple battery cells had failed, so they were being replaced and tested; b) Brunel U - began the race, but Paul Owen's last recorded position was at the Bungalow; c) Russ Mountford, ARC EV Engineering - found no information. Despite posting a picture yesterday showing their bike on the Ferry, Darvill Racing was a no-show today. Darvill's picture showed an Empulse R rather than an Empulse TTX, so it's unclear if they're still planning to enter the race and if so what with. This must be Anstey's day to set lap records - because he broke the outright lap record riding a stinky noisy gas bike earlier today. 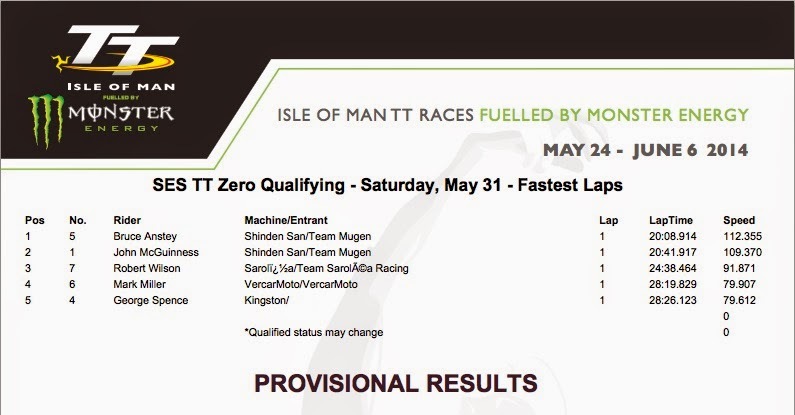 The 2013 TT ZERO lap record was 109 miles/hr, by Michael Rutter of MotoCzysz. That's now history now that both of Mugen's riders have beat that record. Is it possible they'll get up 115 miles/hr? It's racing, so we can't promise anything, since both could crash out leaving the win to other teams. Last thing to note is that Sarolea's Robert Wilson finished faster today (91.871 miles/hr) than Buckeye Current's Rob Barber did yesterday (89.607 miles/hr). It's fair to say that 1st and 2nd place are sown up by Mugen's riders, and it'll be the luck of the race as to which is on top. The 3rd place seems to be up for grabs with Buckeye Current and Sarolea as the main contenders. The next TT ZERO event is at 16:00 GMT on Monday. Here's some facebook postings from 2014 TT ZERO teams following yesterday's qualifying race. This picture by Team Sarolea shows what it's like at the starting line. Mugen Shinden tweeted: Our boys are pretty shattered after pulling an all-nighter repairing Bruce's bike after a part failed in FP1, ready for Q1 now though. During the practice round yesterday, Anstey had to "retire" early in the lap and a picture we captured off Twitter showed flames, but the bike wasn't on fire it was skidding (apparently). This tweet says Anstey will be back for the qualifying round today. Yesterday they posted a picture of him just after retiring from the race. The Buckeye Current team got some good news coverage in local press. Buckeye Current Racing had a technical problem yesterday, and won't go out for a practice round today. They'd posted yesterday the results in the practice round was enough to qualify them for the race, so maybe they don't need to enter the qualifying round?